Que up the old 33rpm record player and what did you find? While it has only just dropped below 32 degrees here in Georgia, we know the importance of a diesel engine block heater and block heater cable. Hey, we’ve got ‘em stock for your Cummins engine – Block Heaters for ’89-’98, 5.9L and ’94-’15, 5.9L & 6.7L trucks and Block Heater Cables for ’89-’15, 5.9L & 6.7L Cummins as well as the new Ram EcoDiesel trucks. And, while we’re on the subject of cold weather we would like to do a little more than just sell product(s). Below we have some data from Cummins, Inc. that talks about winter operation of your diesel engine. You’ll be surprised to learn that a block heater is a “recommended “ item starting at 0 degrees, a “required” item starting at -20 degrees. And here in Georgia we were worried about a little frost on the grass. Finally, here are two other items you’ll want to consider for these upcoming Winter months: seat heater elements (they’re really easy to install) and winter fronts (Cummins recommends their use at temperatures below 30 degrees). 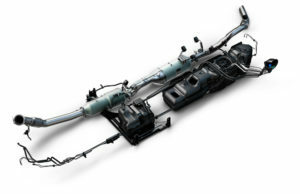 Your Cummins Turbo Diesel is available with a few key features to improve the cold weather operation of your engine. These features will help to protect your engine and improve your truck’s cold weather starting capabilities. The engine block heater is a resistance heater installed in the water jacket of the engine just above and behind the oil filter. It requires a 110- to 115-volt AC electrical outlet with a grounded, three-wire extension cord. The engine block heater is required only when ambient temperatures are below -20F (-29C), but recommended at temperatures below 0F (-18C). For full capability, once you turn on the engine block heater, it needs to run for one hour before you start your truck. 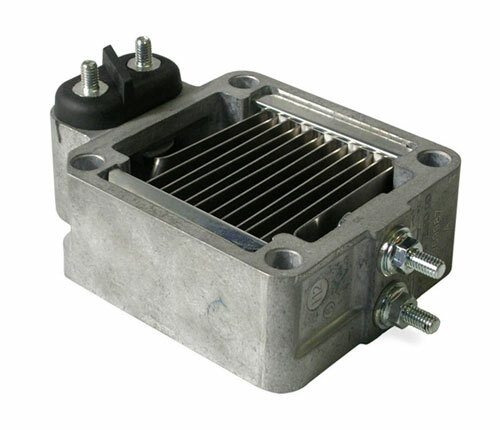 A 12-volt heater built into the fuel filter housings helps prevent fuel gelling. It is controlled by a built-in thermostat. If ambient temperatures are low, the engine idle speed will slowly increase to 1,000 rpm after two minutes of idle, if the following conditions are met: Do not depress the brake or throttle pedals, the automatic transmission must be in park, and the vehicle speed must be zero. To cancel the fast idle feature, apply the throttle. For more information on the fast idle feature, consult your Owner’s Manual. A battery loses substantial cranking power as the battery temperature decreases to 0F (-18C). At 0F (-18C), and the engine requires twice as much power to crank at the same rpm. The use of 120-volt AC powered battery blankets will greatly increase starting capability at low temperatures. 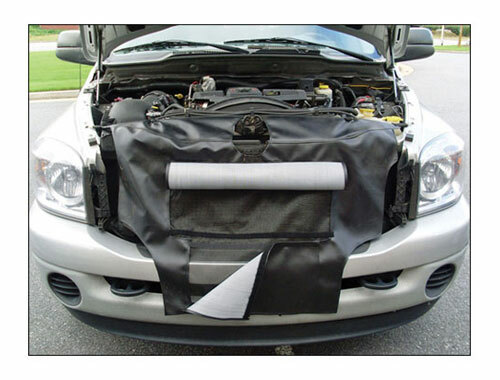 Suitable battery blankets are available from your authorized Mopar dealer. A winter front, or cold weather cover, is designed to be used in ambient temperatures below 30F; especially during extended idle conditions, to reduce condensation build-up within the engine crankcase. The cover will also drastically increase the warm rate inside the cab. The cold weather cover is available as a part of the Cold Weather Prep Package or through your authorized Mopar dealer. Have you ever been asked to find the glow plugs in your Cummins Turbo Diesel? If so, someone is having fun with you. Since the first Cummins-powered Ram truck was produced in 1989, Cummins uses a grid heater, not a set of glow plugs, to heat the intake air. Diesels need a cold-start aid, while gas engines don’t. Gas engines use a spark to ignite a highly flammable mixture of gasoline and air. The spark is the ignition source, and is much less affected by cold air and cylinder temperatures. Diesels, on the other hand, use only compression to ignite the diesel-and-air mixture. In severe cold weather, the intake charge and fuel can be cold enough that compression alone will not create the ignition needed for combustion. This is why virtually all diesels come with some type of aid for cold starting. The two most common types seen in today’s diesels are grid heaters and glow plugs. Both of these technologies serve a similar purpose, albeit with slightly different approaches. The grid heater found in your Cummins Turbo Diesel is effectively an electrical element that sits in the entrance to the intake manifold. It is very similar in concept to what you’d find in a hair dryer, but stronger, hotter and more durable. When the engine is keyed on at cold temperatures, the “wait to start” lamp will be illuminated. During this time, the vehicle battery is being used to heat this electrical element. When the engine is cranked, air is drawn over this hot element, meaning that the air entering the cylinders is preheated, and hot enough that the diesel-and-air mix will ignite easily when compressed. Glow plugs, on the other hand, are smaller, individual heaters that sit within each cylinder. They often look similar to an injector, with a tip that protrudes slightly into the chamber. During starting, a similar process occurs—while the “wait to start” lamp is illuminated, electrical energy from the batteries is used to heat the tips of these glow plugs. This heat is transferred directly into the combustion chamber while also creating a hot region in the combustion chamber from where the combustion itself can start. The glow-plug system has its benefits: the smaller size means they are quicker to heat-up and they draw less amperage from the batteries. Drawbacks: the system is more complex and they are not as effective after the engine has started, meaning there is a potential for rough idle and smoke. Grid heaters are a simple approach to heating the intake air that results in a more robust system that is less likely to fail, easier to service and leads to less complexity under the hood. The only real drawback to the grid heater is that it has a very large current draw – up to 200 amps. Furthermore, wait-to-start times can be up to 30 seconds when starting at extreme cold temperatures (-20°F), and potentially even longer if starting at high altitude and extreme cold. Grid heaters offer a secondary benefit in that they can be used after a start to help keep the intake charge warm, which reduces white smoke and gives better combustion. After the engine has been started, the post-heat cycle takes over. If the temperature is below 59°, the heaters are cycled on and off depending on air temperature and how quickly the Cummins gets warm. You will notice the voltmeter acting like a windshield wiper as the heaters are cycled. They draw 120 amps! Thus, the lights flutter as the battery is working to supply current to all circuits. Again, this condition is normal. It occurs on all trucks manufactured from ’89 to current (including the newer ’07.5 and up 6.7-liter engines. Let the “Wait to Start” lamp turn off. Turn the ignition off for 5 seconds. Please remember that excessive cycling of the grid heaters will result in damage to the heater elements, and will reduce your battery voltage. This should be self explanatory, with the previous discussion on grid heaters you would never want to pour fuel or other flammable liquids into the throttle body air inlet opening in an attempt to start the vehicle. This could result in serious personal injury. It is important to think about the effect cold weather has on your truck’s fuel system. The most common issue—wax build up—has concerned diesel operators for years. Let’s review Cummins Service Bulletin 3379001, learn how cold climate can affect your fuel system, and then look at any differences driven by biodiesel fuels. Cummins engines are designed, developed, rated and built to operate on commercially available diesel fuel. However, there are some options if you’re experiencing fuel gelling issues. All middle, or intermediate, distillate fuels, such as jet fuels, heating fuels and diesel fuels, contain paraffin wax. Paraffin wax occurs naturally in the crude oil from which fuel oils are distilled. Generally, higher-boiling distillate fuels, such as Diesel #2 (2-D), have a higher concentration of paraffin wax than lower-boiling distillate fuels, such as jet fuel. Because of the strong relationship between temperature and solubility of wax, wax separation is a problem in handling and using diesel fuel during cold weather. Cloud Point: The cloud point of fuel is the temperature at which crystals of paraffin wax first appear. The fuel cloud point should be a minimum of 11°F below the operating ambient temperature for proper flow through the fuel system. Cold Filter Plugging Point (CFPP): The temperature at which a certain fuel will become saturated with wax and causes fuel filter plugging problems per standard ASTM D6371. Pour Point: The temperature at which fuel will no longer flow per standard ASTM D97. Now that we know that, what can you do to protect your fuel system? There are a number of fuel additives available which reduce the pour point and CFPP of diesel fuel. These winter additives reduce the pour point by as much as 70F and the CFPP by as much as 30F. These additives alter the size and shape of wax crystals, allowing pumping of fuel at lower temperatures. Before purchasing such an additive to treat fuel, ask the fuel supplier whether the fuel already contains a winter additive. Depending on the amount and type of additive already in the fuel, additional additives may not be necessary. Although certain additives can be very effective, they are not a cure all. Their performance varies depending on the paraffin type and content of the fuel treated. 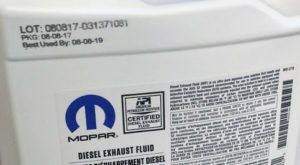 Although other additives are available that can provide some benefits, Cummins Filtration, Fleet-tech Winter Conditioner and Turbo Diesel All Season Fuel Additives are the only fuel additives recommended by Cummins to help prevent filter gelling in cold weather applications. Given the greater availability of biodiesel, it is important to understand how this fuel differs from ultra low sulfur diesel (ULSD) and what effect it can have on your fuel system. Biodiesel inherently has a greater risk of wax build-up and microbial growth than ULSD at cold temperatures. The fuel properties change at low temperatures and this can pose problems for both the storage of the fuel and the operation of your truck. If using biodiesel, precautions can be necessary at low ambient temperatures. They include storing the fuel in a heated storage tank or using cold-temperature additives. The additives that can be used to improve the cold weather effect on biodiesel are Cummins Filtration, Microbicide; Cummins Filtration, Asphaltene Conditioner Base; and Cummins Filtration, Biodiesel Winter Conditioner. As a precaution, the fuel system for your Cummins Turbo Diesel includes heated fuel filter housings to protect your filters from clogging and to prolong the life of your filters. Cold-weather waxing can be minimized by monitoring your truck’s performance and watching for any electronic vehicle information center (EVIC) messages. For further information on fuel filter maintenance, consult your Ram truck Owners Manual or the Cummins Service Bulletin 3379001. Editor’s note: I reviewed the 52 page bulletin 3379001 with the latest revision being August 28, 2013. Specifically I was looking for data on fuel additives, a search that was prompted by TDR writer Scott Dalgleish’s discussion of products on page 95. However, in the new bulletin it did list the aforementioned Cummins products (it is not a surprise to your editor that other brands are not tested/listed) that can be used in your engine. Ahhh. This explains so much! I’m a new diesel owner and did not know about the voltmeter dance or the other tips! I thought something was wrong with my truck. I stumbled on this site researching how to stop the occasional “click, no start” problem. Still haven’t solved that, but you’ve just saved me the cost of ANOTHER pair of brand new batteries and cables! Thanks! Glad the tips were able to help you out and save you some money. Give us a call if you have a tech question you need solved. When you plug the block heater in it is always on. So do the heated fuel filter housings come on automatically at a certain temp while the truck is off or is it just meaning that they are on any time the truck is running? Whether the heated fuel filter housing is controlled by a sensor or thermostat, they come on at a certain temperature. Miles This being my first winter with it , after start up and letting it idle for at least 5 to 10 min, I put the truck in gear and nearly touching the gas pedal the rpm’s fluctuate couple hundred , when I accelerate it’s fine . I have a 2017 Ram Cummins 6.7 with an automatic transmission. I enjoy the truck very much as this is my first diesel. My question is this; when driving, especially when starting from stop the transmission seems to upshift through the gears faster than would seem normal and seems slow to downshift when starting up mild grades. the result is lugging. Is this a problem? I have recently started using the manual selector when driving on local roads to prevent lugging. Should I rely on the trans computer to determine shifting times or continue manual shifting? Your best bet is going to be to check with your local dealer to see if there is a transmission flash update or if your truck has some electronic gremlins in the valve body. This is normal. This is the grid heaters turning on and off. It will do this until the engine warms up completely. Should the fuel START/RUN solenoid fail to energize (come up) and/or hold in the “UP” position, do not let its malfunction leave you stranded. Have an assistant attempt to start your truck while you move the solenoid’s plunger up to the “RUN” position. If it starts and the solenoid holds in the “RUN” position, drive it to your destination for further troubleshooting as time permits. If the solenoid fails to hold in the “RUN” position, tie-wrap it in the “RUN” position, and drive it to your destination. Cut the wrap, and the engine will stop. So, we presented a tip to get you to a desired location. Does the problem lie with the solenoid, the relay to the solenoid, the fuseable link that feeds the solenoid or a fuse? Do a voltage check at the solenoid’s three-wire connector. Negative goes to the Black/Red trace wire. On “START”, positive 12-volts will be at the Red/Black trace wire. If voltage is present for “START” the solenoid is likely the problem. No voltage for “START”? Chances are that the solenoid is okay. Check the relay, fuseable link or fuse #9 as the source of the electrical malfunction. Certain people like to jump in my truck, start it and leave after about 2-3 minute warm up. It averages about 25_30 at night here. It is a 2017 2500 Cummins…. Should I continue to freak out and get upset with them it is it really not that bad. ……….I have the freaking remote start, and I think that is why it pisses me off even more. You don’t need to freak out. The truck will be fine being driven after a few minutes as long as it isn’t abused. Power Service additives hace a cummins endorsement , are they not safe to use ? If you’ve found that Power Service additives are approved for Cummins diesel engines, there’s no problem using a product other than what we recommended in our article. It’s sometimes difficult to cover all of the products available. It sounds like it might be either injectors or more likely a problem with the batteries. If either one or both of the batteries are not putting out the required amps, your truck will have starting problems. Download The Perfect Collection and go to page 144 for more explanation. Originally from the warmer Austin, TX, I have a 2005 Ram 3500, I moved to Denver, CO for a new career, I’m not quite familiar with the cold start or let me say about “plugging it in”. My neighbor also has a Ram 2500 who leaves his truck plugged in around 8-9 pm and still is plugged in by the time I leave home for work at 6:15 am. Will it has any effect on my 3500 if I just leave it plugged all night or should I limit it to 2 hours or so? When I wake up at 5 am, it’s around 5 degree and I go right outside to plug it in before starting my coffee and shower. I have read the owner’s manual, but it said nothing about not leaving it all night. Please advise. Just bought my 1st diesel a 2008 Dodge Ram 2500 with a 6.7 diesel .Just wondering how long of a warm up should I do in 20 to 30 degree weather? I won’t be a problem to leave your truck plugged in overnight, but it does pull about 1200 watts and could run up your electrical bill. What some people do is plug into a timer that starts heating up the engine a couple of hours before you need it. All sorts of opinions on this, but generally folks let their truck warm up for maybe ten minutes or so and drive them. It will take longer for your truck to warm up with it idling than driving it easy to warm up. 03 Ram 5.9 will not start when colder than 40′ or so. ‘Used to plug in for an hour or so and it would start. Then once I left it plugged in all night and now it doesn’t work at all; will not start after being plugged in for an hour or more. ‘Been using starter spray (in little red plug in air filter) forever as the only way to start in cold weather. Am I hurting the engine using the spray? If so why is the red plug in the air filter? I had the air heater examined and was told it was fine but still will not start without spray. After running awhile it starts fine all day long no matter how long it”s been off. It can be the batteries that can cause this, but with this problem it is likely it is the fuel injectors that are the issue. Using starting fluid typically doesn’t cause harm to the engine, but the danger is using it if the grid heater is on causing it to ignite in the intake system and damaging something. On my 2011 6.7 is the fuel filter heater controlled by the ECM or is the plug going into the housing just a power source? Reason Im asking is I plan on running a Fass with there heater and deleting my stock fuel filter. I would like if possible to run fass’s heater off the stock fuel heater plug instead of running there harness to the battery a relay and then tryin to find a key on and off in the breaker box. We’re working on getting an answer to your question. We have some questions of our own about how the system is designed to work. We have confirmed that the heating element has a thermostat that will turn the element off automatically when the desired temperature is reached. The install is very easy with their fuse tap setup. 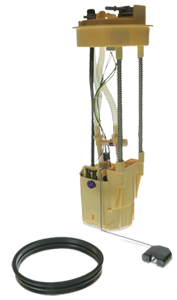 The ECM does control the factory fuel heater based off the temperature it is reading. So you could wire the FASS harness into the factory fuel heater element power supply and therefore would only be powered to operate when the ECM says so. We cannot not verify if this would allow the element to be powered more or less than if he would wire it as per FASS’s instructions. I visit each day a few blogs and websites to read articles or reviews, except this blog provides quality based articles.